So, first off, this is all in fun. I'm trying to get more people to follow my page, and spread the word about my work so I can maintain my access to shelter, running water, and food etc. If you don't win something today I'm genuinely sorry. I have felt the disappointment of not winning. But, keep track of the page because you never know when the next giveaway will be! Hover over "Liked" and wait for a menu to appear. Then choose the interest list you'd like the page to join. If you have never created an interest list, then choose "+ New List" and create one. You may need to repeat the process to then add the page to the list. I honestly don't remember. Obviously or not, the absolute best way to get page updates is to interact. Tell me what you love, what you'd like to see more of - different colors, different sizes - more sets, more buttons, more headpins, more jewelry. Help me help you. Ultimately this contest is an investment in information. The more information I get, the more contests I can hold. That makes sense, right? Alrighty then! The names. Since I had no way of knowing who became a fan of the page at what time, I just made the list alphabetical by first name. I was able to gather 87 names that fit in one of the three categories above, 132 being lost in Facebook's privacy rules. 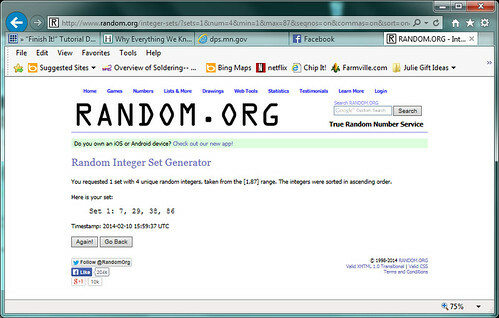 I used Random.org to create a list of 4 random numbers between 1 and 87. Check this new post to see if you're of of the new winners. Hooray! You all have until 11AM CST Tuesday, February 11, 2014 (tomorrow!) 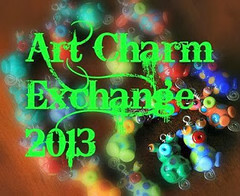 to message me or write to me on my facebook page with your bead choice and address. 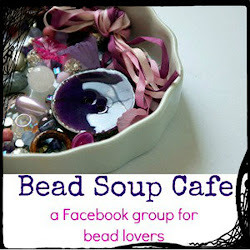 It will work like this: (winner 1) gets whatever giveaway bead she wants. Jen gets whatever bead she wants after that, etc. 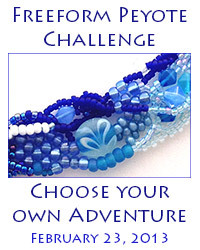 So, (winner 4), you'll potentially need three back-up choices in case the other three have your taste in beads. If I do not hear back from someone by 11AM tomorrow, then I'll randomly choose someone new and update both this blog page and announce it on my Facebook page. If I've forgotten something important, which I likely have, I reserve the right to add caveats, exemptions, limericks etc. Thank you, again, everyone that has been following or joined my Facebook fan page! Keep watching!